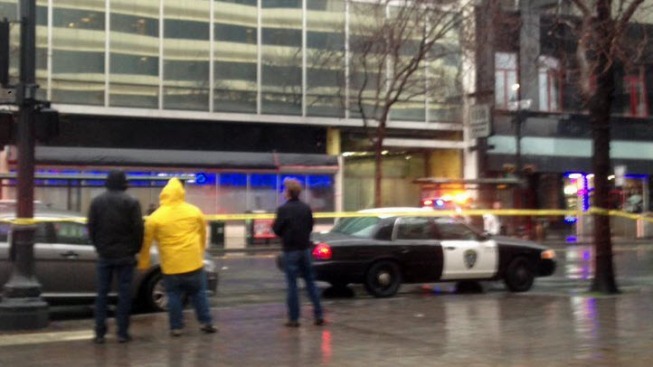 A shooting in Downtown Oakland Tuesday afternoon injured one man and has resulted in the closure of Broadway near 13th Street while police conduct their investigation, according to city officials. The shooting was reported at 3:28 p.m. at a bus shelter on Broadway and the victim was taken to the hospital with injuries that are not considered life-threatening. Witnesses reported multiple shots and the glass from the bus shelter was shattered and spread over the nearby ground, according to police. Officers are currently canvassing the area looking for suspects and additional witnesses. They are also reviewing security camera footage from area. Anyone with information is asked to call the Oakland police Felony Assault Unit at 510-238-3426.